Siena Bernstein is leaving her yoga mat behind for a semester of study abroad in Munich. She’s thrilled with the prospect of a German adventure (her horoscope is encouraging as well), but she hopes to make more than just her dreams come true while she’s there. Before he died, her dad made a “Carpe Diem” list—a top-ten list of things he wanted to do while he was alive. He did all the things he’d set out to, except one. He never went to Germany to thank the man who helped smuggle his family past the Berlin Wall. Now Siena is determined to find that man and complete the “Carpe Diem” list before her semester abroad is over for good. With the help of two new friends, a handsome RA in her dorm, and some serious karma, she just might be able to do it. 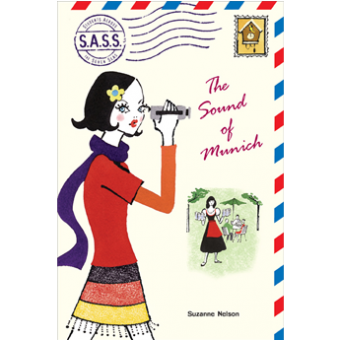 “Chen read her entire Munich guidebook cover to cover…twice,” Meg said. Siena just shook her head in awe. “I have to take a break from bio every once in a while.” Chen shrugged. “Hey, if you’ve got the gift, put it to good use. And now we won’t have to pay for a guided tour.” She took a swig from her beer mug, waiting for the tartness to make her cringe. But the beer actually tasted great between bites of sausage and potatoes—the flavors all blending. It was like the world’s most perfect comfort food, or Germany’s anyway. Siena raised her mug to her new friends. “Here’s to an amazing semester in München,” she said, clinking her mug to theirs. “And to Biergärtens,” Chen said. “And to breaking rules,” Meg said, giggling and giving Siena a nudge. Siena smiled. A day and a half ago, she’d left the only home she’d ever known. But as she laughed and talked in the shady grove of chestnut trees, she thought maybe she could find a second one here.